When summer is in full bloom, the last thing you will want to do is turn on the oven; this not only warms the inside of your home but you will be faced with confronting the full heat blast that comes from opening and closing the oven door. The icebox keep you cool and satisfy your sweet tooth. Chocolate raspberry icebox cake is an rustic ombre dessert that begs to be eaten. Pureed raspberries are combined with whipped cream to form the creamy layers between the chocolate wafers. You can use either store bought or bake a batch yourself (although that would defeat the purpose of a no-bake cake). Everyone loves Oreos so this icebox cake will be an obvious hit. Cream cheese, crushed Oreo cookies and caramel ice cream come together to build a cake that will tempt you with second helpings. If you are looking for an inexpensive and easy dessert, this pistachio icebox cake is the perfect fit. Alternate layers of pistachio pudding, whipped topping and graham crackers are piled high to make this cake. Chopped pistachios are sprinkled on top to add crunch. 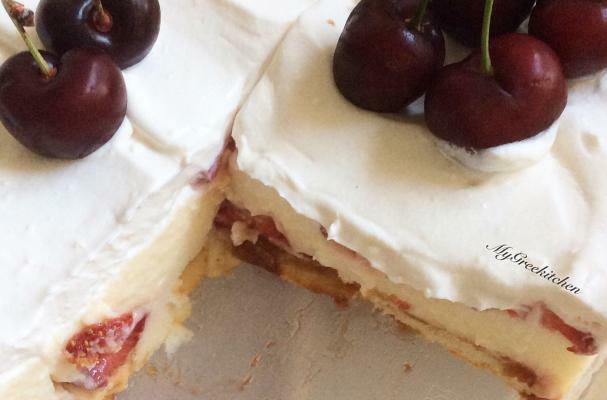 Banana split icebox cake is as tasty as it is easy. Layers of graham crackers are paired with pudding and topped with fresh fruit. Since this cake sits in the fridge overnight, the dry crackers soak up the extra moisture from the pudding which creates a cake-like consistency. Once you see how simple it is to create an icebox cake, you will preparing them all season long. Strawberry cherry icebox cake utilizes to seasonal fruits to create this dynamite no-bake dessert. The fresh fruit is layered with custard, whipped cream and store bought lady fingers. I recommend preparing this cake the night before so that all the different flavors have an opportunity to mix and mingle.